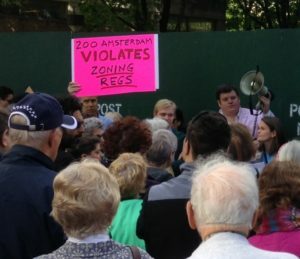 More than 100 New Yorkers rallied today in front of the project site, carrying signs that read “Don’t let a developer’s ‘alternative facts’ destroy our neighborhood,” “Save Our Sky,” etc. LANDMARK WEST! opposes this tower and everything it stands for. Because this tower opposes everything WE stand for. It opposes everything that the Upper West Side is about. This is not progress. This is not sound development. This is a violation of our neighborhood. And it it NOT legal! That’s why LANDMARK WEST! signed on to the zoning challenge filed with the Department of Buildings yesterday. Thanks to many of you who have contributed, LANDMARK WEST! has raised enough money to bring legal counsel on board to fight this project. We’re all here because our neighborhood is under attack. Together, we must summon everything we’ve got to fight back – against this tower AND against a system that enables developers to manipulate and mislead city agencies and the public. Otherwise, this is going to happen again and again and again. We’re standing up for nothing less than the soul of the Upper West Side. Our soul is not for sale.